APN Ad: "It is not a dream, if we will it"
Americans for Peace Now placed a large ad in a special supplement that the Israeli daily Haaretz published this week to mark the 150th birthday of Theodore Herzl, the visionary Zionist who kicked off the process that lead to the birth of the state of Israel. Continue reading APN Ad: "It is not a dream, if we will it". 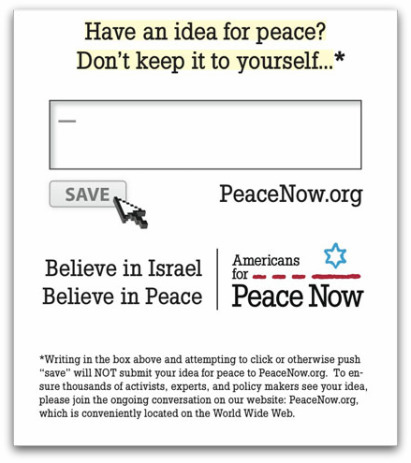 Take what the ad says to heart (and fingers), and share your ideas by way of a comment here, and especially in response to the many posts in the Peace Now Blog and other items on the Website. Continue reading APN Ad for June, 2009. Continue reading APN Passover Ad. Continue reading February 2009 APN Ad. APN responds to what Prime Minister Olmert called a "pogrom"
Continue reading December 2008 Ad.